While a majority of Americans believe that bankruptcy for U.S. automakers would have a major impact on the economy, they are evenly split about the prospect of government financial assistance for the big three, a new CBS News poll finds. 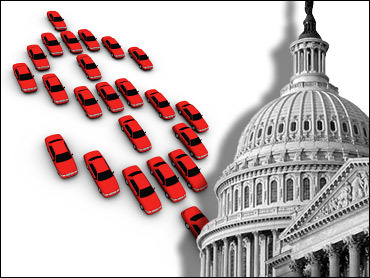 Forty-five percent of those surveyed approve of government assistance for Ford, General Motors and Chrysler, while nearly as many - 44 percent - disapprove. There is more consensus when it comes to the conditions of any bailout. More than two in three say that if taxpayers do help automakers, the government should have a say in how the companies are managed. That could have something to do with whom Americans blame for automakers' current problems: While 28 percent say the companies' struggles are due to conditions beyond their control, a far greater percentage - 56 percent - blame management decisions. And asked if the government should require U.S. automakers to produce more alternative-fuel cars in exchange for assistance, 66 percent said yes. Despite the divided views on assisting automakers, fifty-five percent predict there would be a major impact on the economy if the companies go out of business. Thirty-five percent say there would be a minor impact, while eight percent say there would be little or no impact. The automakers' economic struggles may be having a negative impact on their sales. Thirty-one percent of those surveyed say the companies' economic problems make them less likely to purchase a car from U.S. automakers. Only 11 percent of those surveyed say the companies' economic struggles make them more likely to buy cars from the automakers. Fifty-five percent say it makes no difference. This poll was conducted among a random sample of 1,098 adults nationwide, interviewed by telephone December 4-7, 2008. Phone numbers were dialed from RDD samples of both standard land-lines and cell phones. The error due to sampling for results based on the entire sample could be plus or minus three percentage points. The error for subgroups is higher.